Part of choosing the best fit service starts with understanding what it is all about! Take a look at the details for each service I offer. Each service comes down to a preference choice. The key difference between each service is the shaping of the nail, so really choose what you like best! This is a one of a kind design that takes as long as you might think. Everything you see here was done freehand with no added stickers or gems, completely 100% hand drawn. A set like this cost around $130. To learn more about what a sculpted set entails click the “Learn More” button. This is one of my simplistic yet elegant designs. Here I used decals for the gold edging with a matte top coat to give it that glimmer effect. A set like this cost around $65. To see the different between a sculpted and full set take a close look at the pinky. Here you can see the tip and edge are subtle different in views. To learn more about a full set click the “Learn More’ below. There is always something new in the nail world and here is another Aprés GelX set. Here you see a design done by hand with some nail pieces added. The Ombré effect is also done by hand and not an air bush tool. A set like this cost around $85. You can see the subtle different in the nail shape if you compare the pinky. GelX Extensions come Pre-shaped and Length to give you a perfect shape every time. Click the button below to see the process and difference of service. I want to be able to assist my clients as much as possible but I have to face the truth. I’m growing as an independent artist and although that is an exciting thing, I am loosing time, to assist like I normally would. So please take a look at some how-to’s below and for any technical problems with your booking please text (623)-295-2564 and my wife will reply to fix the issue. Unlike other online accounts the ideal way to create an account with Acuity is to start by booking your service. As you make your way through choosing a service, add-on (as needed/wanted), date and time. You’ll then be taken to a screen that will ask you some quick questions and to agree to policies. Each policy is put into place so that every client is treated fairly and respected for their time and appointments. Once you scroll to the very bottom be sure to read carefully your options for finalizing your booking. You can choose to PAY NOW or to BOOK but a card will be required. I ask for a card in order to uphold my 24 hour policy. A 24 hour policy is in placed and honored in order to allow clients to cancel and to book. RETURNING CLIENTS look for the top left “Log-in” button and speed through the booking process for your future services. My system will then charge your card a $1 refundable fee in order to verify that you card in valid. If you have chosen to pay for your service in advance then the end process will still be very similar. Be sure to pay close attention as the very like box will ask you to save your card for future reference. If you do uncheck this option then you will need to continue entering your card information everytime. After, you’re taken to a confirmation page embedded to the booking site. But no fear, you will also receive an email the moment you booked your service. BEFORE you exit however, be sure to register for an account. If you are unsure if you would like to register for an account as a new client then be sure to KEEP your email. Once you receive your email you still have a chances to make changes, cancel your service or even register for an account. 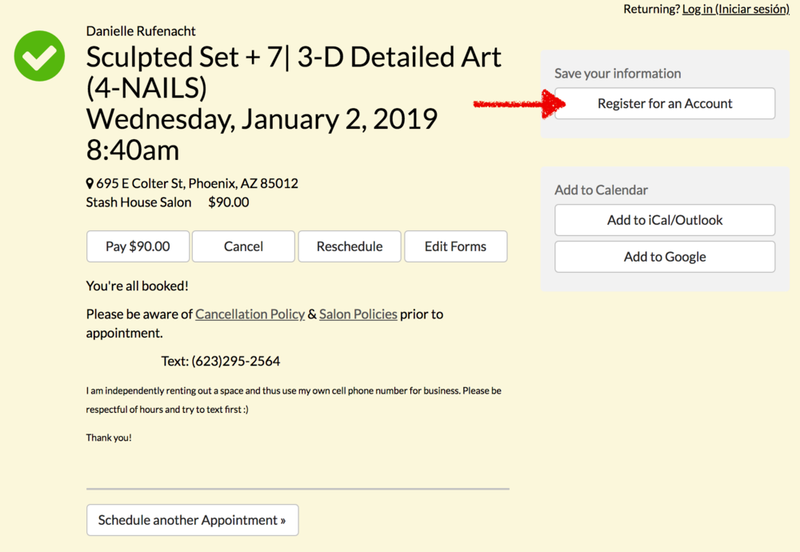 In order to make and changes or cancellation, it goes with our saying you’ll click the “Change or Cancel Appointment” button but whats NOT clear is registering for you account AFTER the fact. Once you click on this option you’ll be taken to the same embedded confirmation page as from the start. After the fact the only details left to complete your account is a password. After which you can log-in every time you want to book and to can move quicker through the questions, card on file and personal details, you can focus on your service wants and needs. So yah! Sounds simple, but it’s not as obvious until it’s been shown to you. for any technical problems please fill out the form below. Please be aware that Stash House is a nail salon that rents out space to independently owned and operated nail techs. It is to not be confused with each personal nail techs (d/b/a) but rather where business is operated at. If you are in need of any booking assistance or have questions about the services I personally offer please make your way to the “More” page for details. -Bilingual (Spanish & English) speaking.